1st Prelude. I will imagine myself before the judgement-seat of Jesus Christ, with two unshaken witnesses beside me, my guardian angel and Satan. 2nd Prelude. I will ask for grace to know myself, that I may be able to judge myself here. Three things are to be feared in the particular judgement: 1. The judge; 2. The account to be rendered; 3. The sentence. CONSIDERATION. By penance we may make the judge favourable to us. The judge is Our Lord Himself, Whom we have neglected, offended and injured, with all the malice of sin, and so often, so deliberately, even when He loaded us with benefits. Now He is a God of mercy, ready to pardon at the first sign of repentance; but then He will be only a God of justice; as His mercy was infinite, so will be His justice; not the smallest fault, not an idle word, He has said, will pass unperceived, but will be severely punished in purgatory. These thoughts filled holy Job with fear. Who shall reprove His way to His face? And who shall repay Him what He hath done? POINT II. The account to be rendered. APPLICATION. These truths filled even the penitents of the desert with fear; they never thought they had sufficiently atoned for their past lives. The only means of consolation under this dread were tears and constant mortification, a life of continued penance until death. Imitate them; try to lighten by such a life of penance and mortification your heavy account of sin, imperfection, and negligence; and do it with special generosity during this holy season, two-thirds of which are already gone. CONSIDERATION. By penance we may insure a favourable sentence. The sentence of the judge will be irrevocable — life eternal or death eternal; the first securing the soul of the just endless glory and the delights of Heaven, although it may for a while be detained in a place of expiation; the second condemning the soul of the sinner to Satan and the eternal pains of Hell. APPLICATION. You earnestly desire to be amongst the number of the elect, to enter into the immediate possession of Heaven. It is possible: with the grace of God, endeavour to live as a holy religious, expiating by constant penance and mortifications all that yet tarnishes the purity of your soul. This is the infallible but indispensable means of ensuring what you so much desire. Oh, how joyfully, after such a life, will you meet death! And why should you not do so? 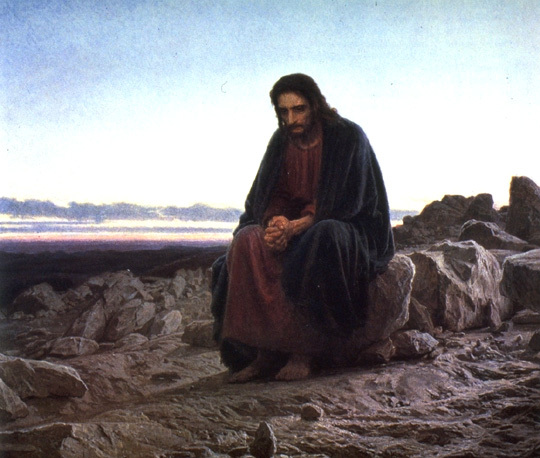 COLLOQUY with Jesus doing penance for us.